The latest instalment of his Lordship’s diary is begining to be aired over at SHROPSHIRE ALIEN EXCLUSIVE Liberal England. It caused me briefly to ponder punctuation. I first misread “Like so, what?” – a perfectly Bonkerish phase – as “Like, so what?” – which is something his Lordship is most unlikely to say. Much more in line with one of the Well Behaved Orphans, assuming that one can get mobile telephone receiption at the Home. 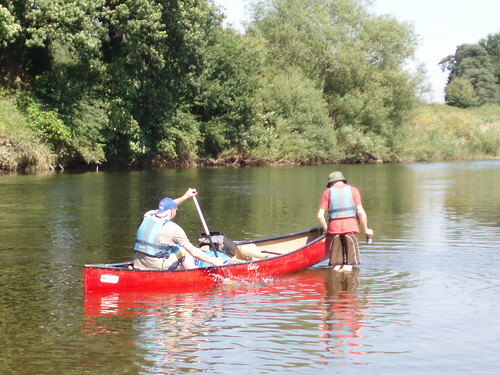 A weekend on the River Wye-oh-why?! So, we spent Saturday and Sunday canoeing 26 miles down the River Wye from Hay-on-Wye to Hereford, with an overnight stop at Byecross Farm (Bycross on the OS map, but Byecross on their own signs, and I guess they should know). I agreed to go because I have always quite like the idea of canoeing – probably dating back to my time with my wonderful French exchange family during my A-levels. One of the times I spent with them at their summer home in the not-quite-Normandy beach town of Wimereux. They had what I now know is called a “sit on top” canoe – a one man affair that is practically impossible to overturn. Solid, rigid moulded plastic, roughly canoe shaped, with an indentation to sit in and a cross-paddle. Paddling on the sea in Northern France was actually rather idyllic, and I really enjoyed it. A few years further on, I joined the canoe club at university and spent a couple of weeks practicing in the swimming pool before eventually deciding that this was too much like hard work and the people there all preferred doing scary things to do with white water rather than lazy things like sitting in the sea. But at least I did learn how to escape from the other sort of canoe that you strap yourself into, if the boat turns over. Two people per canoe, baggage in watertight barrels in the middle, each person has a paddle / oar, but not the useful quick sort with two blades at right-angles to each other. Logistically, the weekend was complicated – ensuring the camping gear was at the campsite before we got in the canoes, and that enough cars were parked at the destination, as well as a few parked at the starting point in Hay, took a lot of juggling, and hanging around for the people who weren’t moving vehicles. Then the minibus towing 8 canoes turned up, we got a very brief safety instruction (“avoid overhanging trees, they have fishing line caught in it; make sure your floatation vest is on tightly – if you end up dead, I want to make sure I can take it off your corpse; and if you get grounded, you both have to get out of the canoe to move it off the rocks, or else you’ll scratch the bottom”) and then we set out. It took 8 hours to go the 16 miles from Hay to Byecross. 8 hours, not sitting peacefully in a gently moving canoe, watching the world go past, but 8 hours actual paddling with some occasional frantic paddling over the rapids to stop the canoe from turning round. By the time we turned up at the campsite, we were knackered. The campsite owner had explained earlier in the day that she wasn’t expecting trouble from us, even though we were a large stag do group, because she expected us to be tired by the time we’d paddled all the way from Hay. She wasn’t wrong. I do very little exercise these days, so I was tired, in pain, and sunburnt all over my legs and neck. (You have to wear shorts to canoe, otherwise you get soaked. You basically have to get out of the canoe to rifle through the bags to find the suncream, and it all gets washed off when you get back into the canoe. So, sunburned on the legs which only very rarely actually see any sun). And I was totally ready to quit by the end of the first day. Someone had floated the idea of phoning the hire guy and asking him to get the canoes back from the campsite rather than Hereford Rowing Club. I got it in my mind that this was definitely going to happen, and was gutted when we went around the campfire later in the evening and democratically decided to continue. Still, overnight, we camped, sang songs around the campfire, barbecued and generally caroused. In the morning, there was the Incident With the Bacon – bacon that had been out in sun for 24 hours was barbecued and turned into bacon butties that looked unappetising and simply never got the bacon smell. Imagine 16 hungry guys around a barbecue, and chef says “anyone for a bacon butty?” and there are no takers… Hmm. However, it seemed that 15 of us managed not to get food poisoning, and after the one who did was ferried back to the railway station, we finally got back in our boats, with much complaining and creaking of joints from me and P. The river is much slower from Byecross to Hereford – it’s deeper and stiller and needs you to put even more work into the paddling because the water itself is hardly moving at all. We got up early because we thought it would take longer. And P and I got up earlier still because we realised it was a fair sized campsite with only one single shower, and if even only half of our group wanted to wash, there would be quite a queue. It was definitely tougher going the second day. Our hands were already blistered and sore from the paddles from the day before; our backs, necks and arms were acheing like nothing I’ve felt for years; and worst of all, the organisers weren’t caffeine people!! There was no coffee or tea for breakfast. Although I had brought a kettle and tea, I didn’t think I had enough meths to boil a kettle, so didn’t make any myself. I had also read on the map that there was a PH (pub) on the route before Hereford, where I thought I could stop for coke if not for real, natural, organic caffeine. So within an hour of getting on the water, sitting in the blazing sun blistering up yesterday’s sunburn, I also had a killer headache to contend with. But still, despite our fears and complaints, we did survive. We managed to paddle all the way to Hereford. We never found the pub. We got in two hours ahead of shedule. Even me and P sharing a canoe eventually found our stroke and managed to paddle at a decent speed for at least some of the way. Today we have the aches and pains still, but the actual horror of the weekend is receding a little. We have the injuries to recall it: the sunburn, a stubbed toe going painfully septic, a mysterious rash, “river itch”. But bizarrely, after only one weekend of moderate exercise, both of us can feel the difference it has made to our biceps. I’m still no Schwarzenegger, but I definitely have more muscles than I did when I started. Perhaps I should do more of this exercise thing. There’s a pretty low bar to getting on the river. There were all ages doing it while we were there, including families with children, teenagers, right up to people who looked in their 60s (but might have just spent too much time sitting in the sun in a canoe). It’s just possible we might do it again. But we’re probably getting a rowing machine first to try and get a little more in shape. There seems to be a bit of a trend of sneering liberal elites taking the massive huge pile of user generated content out there, and mocking it. It’s puerile, mean-spirited, “imposing your values on others” and frankly, I can’t get enough of it. It’s Lovely – I’ll take it! – the one I’ve been reading longest, with obsessions of batteries, old remote controls, “thing holding” competitions, etc. Well. I was surprised to hear on the news bulletin the other day that Carol was to quit Countdown… but now, thanks to thoroughlygood, I’ve been pointed at the reason why, and I’m a little conflicted. £900,000 is an awful lot of money for the job she does, and £90,000 is hardly a salary to be sniffed at. However, I can see that having got to the former, she’d be reluctant to switch to the latter.